As soon as we walked in we saw the room where the cocktail hour would take place. High cocktail tables adorned with candles and mirrors were spread out throughout the room. A curved table hugged one of the pillars presenting the space our place cards would go. The room was a mess. It had just gotten dismantled after a computer convention of sorts and still, I was able to picture exactly what I would do to make it my own. I was in love. 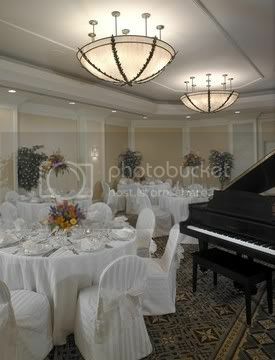 The reception room was even beautiful. Gorgeous little trees with tiny white lites (something I had in my own vision) were already present. The chandeliers were also exactly my style/taste. The only thing that gave me pause was the chairs. They are navy blue and gold. This is not what I had in mind. So now, as I seriously consider this place I must factor in the amount of money it would take to cover these chairs and the tables (whose clothes left much to be desired in my opinion). What struck me most was the woman who showed us the venue. She seemed so thoughtful and helpful and on top of things that I felt comfortable. She wanted to hear my ideas and told me that anything was possible - that we'd work on different options to keep in mind our preferences and limited budget. For whatever reason, I felt that I could really count on her and it made me feel confident that this is the place we've been hoping for. The only other place we have in mind is Fauquier Springs, which we will hopefully see this weekend. The one plus of having it there as opposed to Arlington is that there is gorgeous land and a view of the mountains which would make for great pictures -- but would also require more travel from everyone. Though I want nice outdoor pictures, there is a lot of comfort in knowing the place is a few blocks away. It makes me feel like I'd have a lot more of a handle on everything. And we can always get a limo to take us around DC to shoot wedding pics, can't we? Is it done? For instance, I've seen it so there have been affairs that use only chair sashes in white to cover the back end of the chair...I'd ask the hotel for some recommendations on what has been done before...Way to go! The Hilton sounds/looks awesome...something closeby to your home is even better! You could always choose a church nearby and think of a cool transportation mode to take everyone back to the reception.